Obsolete and discontinued replacement basins by Trent Bathrooms, Armitage Shanks, Ideal Standard, Qualitas, Doulton, Twyford and Spring to name but a few. 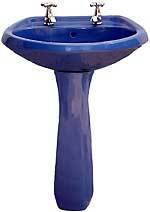 A pedestal basin is so called because there is a pedestal attached below which supports the basin. Sometimes the pedestal does not touch the floor; this is known as a Semi-Pedestal. One tap-hole, where a single tap-mixer (monobloc) would be fitted. Two tap-hole, where traditional taps would be fitted. Three tap-hole, with two external hand wheels (tap-heads) plus a central spray known as a douche. A cloakroom basin is normally used in a cloakroom where space is at a premium, so the basins are small. The back half of the basin is built into the shelf. The other half of the basin projects into the room. Traditional - which insets on top of the counter-top. Under-counter - which is glued or fixed beneath the counter-top. Counter-top - which is fully moulded into the counter-top. However, the front of the basin overhangs to form a continuation of the counter-top.